You can beat the scorching heat of the sun and enjoy the desert sunrise and the Arabian adventures in Dubai while taking all the activities if you have taken the tour during evening or afternoon. If you are fond of roller coaster ride in the desert, then this is the perfect tour for you. Enjoy the desert view with our 4X4 Land Cruise which will take you to the most popular dunes and get a thrilling, adventurous roller coaster ride in the desert. 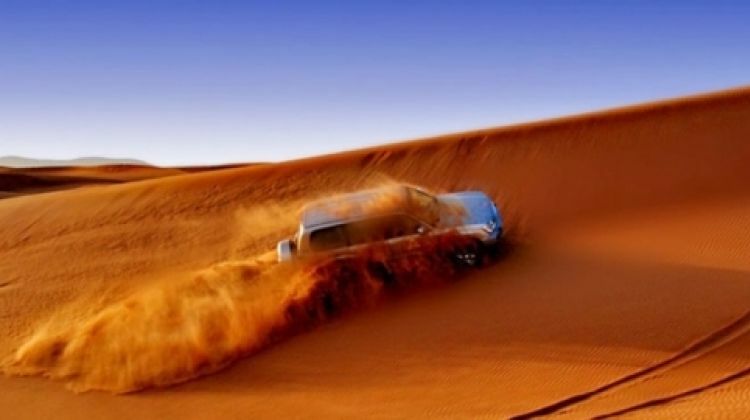 Dune bashing in Dubai desert is one of the most infamous tour attractions that one cannot miss during a Desert Safari Tour. It is an ideal tour if you are with your family, friends or you are with your spouse as the best Safari in Dubai is packed with fun, thrill, adventure and many activities like camel ride, sand boarding, quad biking, etc. based on your choice. Depending on your pickup location, you will be picked up anytime between 06:00 AM – 06:30 AM. Minimum 2 Adults are required for this tour. Pregnant ladies are not allowed for this tour. Your voucher will be emailed to you within 20-45 minutes of purchase. Please display the voucher on your mobile phone with a valid photo ID of yours.